© 2003-2019 Robert A. Freitas Jr. All Rights Reserved. Molecular nanotechnology involves the ability to build structures that are permitted by physical laws, to molecular precision. I am primarily interested in positional assembly, which is a deterministic process in which the components used in a construction are held in known positions and are constrained to follow desired intermediate physical pathways during the entire construction sequence. Programmable positional assembly at the molecular scale is the central mechanism for achieving both great flexibility and the ultimate in precision and quality in manufacturing. An early proposal for the next logical R&D step is here, a technical bibliography for research on positional diamondoid mechanosynthesis is available here, and the first patent ever filed on positional diamond mechanosynthesis is available here. The other key to practical molecular manufacturing is the ability to fabricate massive quantities of molecularly precise structures, or to assemble larger objects from vast numbers of molecularly precise smaller objects – that is, massively parallel assembly. The end result of this development process will be a basic molecular assembler that employs machine-phase nanotechnology (e.g., nanoscale gears, struts, springs, motors, casings) to fabricate molecularly precise diamondoid structures, following a set of instructions to build a desired specific design. 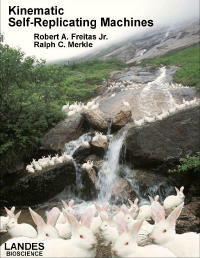 With Ralph Merkle, I’ve undertaken theoretical analyses of possible molecular assembler systems. I’m co-authoring at least two technical books describing the results of this research. The first book, Kinematic Self-Replicating Machines, was published in October 2004 and was available at a substantial prepublication discount directly from Landes Bioscience. The second volume, Diamond Surfaces and Diamond Mechanosynthesis, is in progress and should be published in 2007-2008. The third volume, Fundamentals of Nanomechanical Engineering originally to be co-authored with J. Storrs Hall, is still in progress and might be published in 2009-2010. Our international research collaborations, ultimately leading toward the development of a working nanofactory, are described at the Nanofactory Collaboration website. Kinematic Self-Replicating Machines (Landes Bioscience, 2004). This book offers a general review of the voluminous theoretical and experimental literature pertaining to physical self-replicating systems and self-replication. The principal focus here is on self-replicating machine systems. Most importantly, we are concerned with kinematic self-replicating machines: systems in which actual physical objects, not mere patterns of information, undertake their own replication. Following a brief burst of activity in the 1950s and 1980s, the field of kinematic replicating systems design received new interest in the 1990s with the emerging recognition of the feasibility of molecular nanotechnology. The field has experienced a renaissance of research activity since 1999 as researchers have come to recognize that replicating systems are simple enough to permit experimental laboratory demonstrations of working devices. 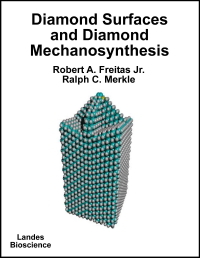 Diamond Surfaces and Diamond Mechanosynthesis (2008-09, in preparation). A full analysis of how to use programmable positional assembly to synthesize most arrangements of atoms permitted by physical law would be, at present, prohibitively complex. A more manageable project is to analyze a significant class of stiff hydrocarbons – in particular, diamond – that could potentially be synthesized by the use of a small set of positionally controlled mechanosynthetic tool tips. There is already widespread interest in the exceptional properties of diamond such as extreme hardness, high strength and stiffness, high thermal conductivity, low frictional coefficient, chemical inertness, and a wide bandgap. The molecular surface characteristics of diamond were extensively investigated both theoretically and experimentally in the 1990s, and many practical questions about the molecular structure of diamond surfaces have now been resolved. The fields of diamond CVD and adamantane chemistry provide additional understanding, both experimental and theoretical, of the myriad reaction mechanisms which can contribute to the growth of diamond. A technical bibliography for research on positional mechanosynthesis is available here. The first patent ever filed on positional diamond mechanosynthesis is available here. See also the Nanofactory Collaboration website for the larger context of this research. 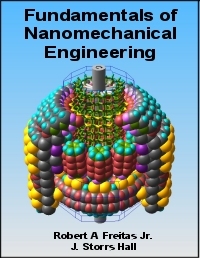 Fundamentals of Nanomechanical Engineering (2009-10, in preparation). This course textbook, intended for use by 2nd or 3rd year college students in advanced engineering programs, will provide a solid grounding in the practical design of molecular scale machines composed of rigid covalent solids, with a strong emphasis on diamond and diamondoid materials. After an introduction to the unique aspects of nanoscale machinery and a review of the computational tools currently available to assist such designs, the mechanical characteristics of key materials and the fundamentals of load, stress, stiffness, and mechanical failure in nanoscale machinery will be explored in detail. This will be followed by discussions and examples of specific nanomechanical components and compound machines including bearings, fasteners, gears, linkages, drive mechanisms, motors and pumps, mechanical energy controllers, sensors, and programmable materials. Molecular Assembler website, last updated on 12 April 2019. Belarusian translation, French translation, Kazakh translation, Latvian translation, Mongolian translation, Norwegian translation, Russian translation, Serbian translation, Ukrainian translation.